DC Comic’s focus on notable Batman artists continues with Tales of the Batman: Don Newton, Vol. 1. Featuring the first reprints of the late Newton’s run from the 1970s and early 1980s, this volume collects a stretch of Bronze Age gems heavy on action in a high-quality format. As with the first edition in the series, which spotlighted Gene Colan, stories are presented here in the original order of publication. This method recreates the experience of pulling original issues to read only the Newton tales. In the Colan volume, some plot elements were resolved outside of issues he penciled. Here, Newton’s prodigious production is recalled with, for instance, a Brave and the Bold story splitting chapters from his run with O’Neil on Detective Comics. This provides more of an “off the rack” reading experience than the necessary story holes in the Colan volume. The collection also represents the first reprints of the final issues of Dennis O’Neil’s classic 1970s Batman run. This includes a Maxie Zeus cycle and a complete League of Assassins saga, which featured the death of Kathy Kane and the introduction of Bronze Tiger into the DC Universe. There’s also a fantastic done-in-one, “The Perfect Fighting Machine,” that includes elements later used in O’Neil’s Venom storyline from the Legends of the Dark Knight series. Although the focus is Newton and other writers are present, this has to be a major selling point for fans of Batman and O’Neil’s work with the Batman Family. Newton’s artistic legacy at DC Comics includes the first “realistic” interpretation of Captain Marvel and the Shazam! Family (1978-1982), a turn as Jack Kirby’s artistic successor on New Gods and a run on Aquaman that was partially collected in the fantastic Death of a Prince trade paperback. His Batman work is the definition of Bronze Age Dark Knight, with dynamic fight scenes and a powerful command of emotion. Of the artist-focused Batman collections released so far, the Newton volume has the widest appeal. Including Brave and the Bold material alongside vintage O’Neil -- mixing sci-fi with street-level -- allows this book to showcase the best aspects of the Caped Crusader through the pencils of an underappreciated master. Michael Fleisher, Bob Rozakis, Cary Burkett, and Martin Pasko join O’Neil behind the typewriter, with equally compelling plots involving The Riddler, Man-Bat, The Crime Doctor, and Batgirl. The only bone to pick here is, in some chapters, the reproduction. The majority of the stories are sharply reproduced with a clarity never before applied to the original material. Other stories such as the Red Tornado and Man-Bat chapters inexplicably feature muddy details affecting both lines and text. The dip in quality is quite noticeable when it comes to an artist like Newton, whose style was even a difficult match for most of DC’s inking stable. Spotty reproduction was a major problem with the Marshall Rogers collection, which was published the month before. Despite a couple of low-fidelity chapters, it’s hard to declare this volume as anything less than a must-own. There are still no higher-quality reproductions available and, in addition to the brilliant work by Newton, what is featured here includes the finale of one of the great Batman runs by any writer. The length allows for an immersive experience that was somewhat lacking in the shorter Colan volume and would presage the epic Jim Aparo volume to follow. Plus, it celebrates a flavor of Batman that has never been given any treatment beyond the magazines themselves. 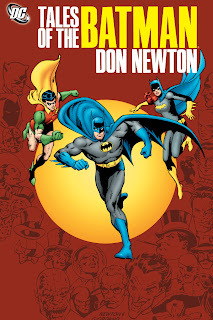 Tales of the Batman: Don Newton, Vol. 1 is essential reading for any Batman fan and an crucial purchase for Batman completists. The never-before-reprinted status of the stories and the intersection of two all-time-greats make this a rich, rewarding read worthy of multiple, lenghty sessions. I'm tempted. But I find the collections made around the WRITER's work result in a better reading experience. I don't like missing chapters in an expensive collected edition. Same here. I would love the writers' volumes which should follow. I hear a Goodwin volume has been solicited...but what I'd really love are writers' volumes featuring Dennis O'Neil, Frank Robbins (he was a writer as well as an artist, so I think it works both ways), Gerry Conway and Doug Moench, the last one having the maximum appeal for me. I'd love a series of omnibuses (omnibi?) reprinting Alan Grant's complete run (minus crossover tie-ins). The crossovers which Alan Grant wrote were refreshingly unconnected...and I think except for a single War of the Gods, all the Crossovers were reprinted in Knightfall, KnightQuest, KnightsEnd, Prodigal, Contagion, Legacy and Cataclysm.